While still a graduate student she began to publish poetry and explored the theme of immobility which is reflected in her first two books, Geste (1979) and Veille (1982). She contributed to literary periodicals La Nouvelle Barre du Jour, Possibles, and Spirale. In 1981 she founded the Auto/Graphe theatre company with Mona Latif-Ghattas and Myrianne Pavlovic. Her book of poems, Blues de mine won the prestigious Emile Nelligan Award in 1985. With Alain Laframboise she founded the literary journal, Trois and the publishing house Trois. With Les Editions Trois she promoted the work of many other writers in Quebec and beyond. 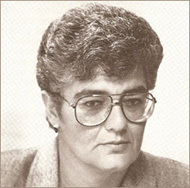 She continued to publish books on a regular basis which include Ecoute Sultane (1987), and Le livre de ruptures (1988). Her Blues de mine was translated and published in English as Lead Blues in 1990. Her novel, Galia qu’elle nommait amour won the Grand Prix d’excellence artistique de Laval in 1992. Alonzo was made a Member of the Order of Canada in 1996 and received a bronze medal from the Société Arts-Sciences-Lettres de Paris in 1997. When she died in 2005 she had published twenty books. She her bibliography.